Welcome to LACE Lingerie. Your big cup specialist (D-K cup). 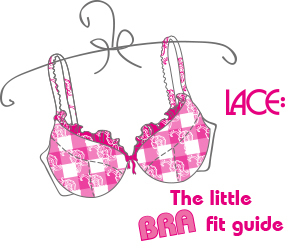 LACE is a favourite online shop for lingerie, bras, underwear, shapewear, bikini, swimwear and beachwear up to a K cup. On lace-lingerie.com, you can find a huge selection of fashion lingerie and basic functional underwear from designer brands, such as Anita, Chantelle, Cleo, Curvy Kate, Empreinte, Fantasie, Freya, Marie Jo, Panache, PrimaDonna, Twist, Shock Absorber, Triumph, Wonderbra and more. In addition to these brands, LACE also sells its own designs under the labels LACE Design, a range of bust-friendly clothing; and LACE Swim, which both incorporate years of large cup expertise, since 1987. The LACE online shop has more than 1,000 Products in 10,000 differents variants, colours and sizes on stock, so we can dispatch immediately after we receive your order. In all big cup sizes, we have numerous styles and types of bras, e.g. Balcony bras, Push-up bras, Bridal bras, Nursing bras, Sports bras, Strapless bras, Swimwear, Bikinis, Tankinis, Swimsuits, Body or Basques, and Shapewear. So there's a good reason to shop at lace-lingerie.com. Don't forget to take a look at our SALE % section, since we often can present great offers with up to 50% discount. We accept payments via Paypal oder credit cards (Visa and Mastercard).